For the first time discovered gas-dust disk around a sun-like star, decorated with spiral arms, similar to the spiral arms of galaxies. These features may provide clues to the presence of embedded but as yet unseen planets. 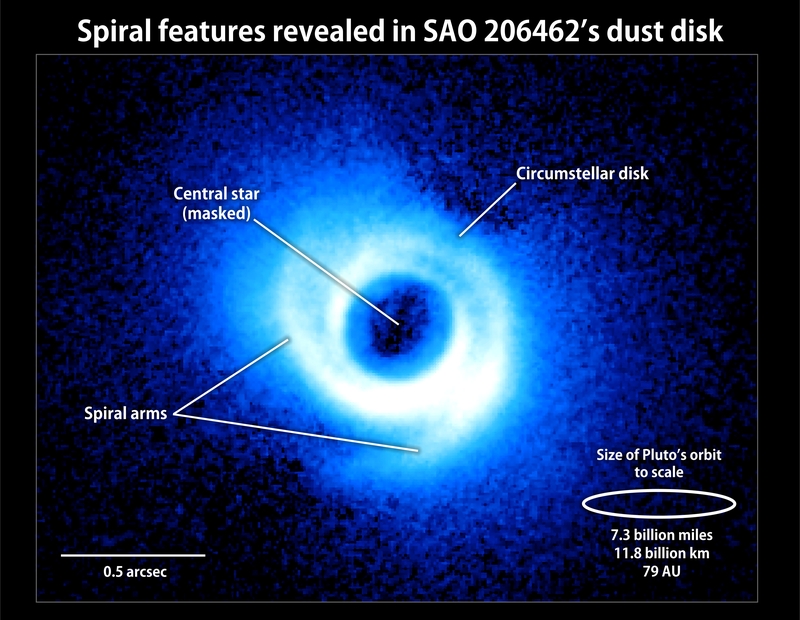 According to Carol Grady, an astronomer with Eureka Scientific, Inc., detailed computer simulations have shown that the gravitational pull of a planet inside a circumstellar disk can perturb gas and dust, creating spiral arms. Now, for the first time, they ‘re seeing these dynamical features. Grady’s research is part of the Strategic Exploration of Exoplanets and Disks with Subaru (SEEDS), a five year long near-infrared study of young stars and their surrounding dust disks using the Subaru Telescope atop Mauna Kea in Hawaii. The newly imaged disk surrounds SAO 206462, an 8.7-magnitude star located about 456 light-years away in the constellation Lupus. Astronomers estimate that the system is only about 9 million years old. The gas-rich disk spans some 14 billion miles, which is more than twice the size of Pluto’s orbit in our own solar system. According to John Wisniewski, a collaborator at the University of Washington in Seattle that once these systems reach ages of a few million years, their disks begin to show a wealth of structure rings, divots, gaps and now spiral features. Many of these structures could be caused by planets within the disks.